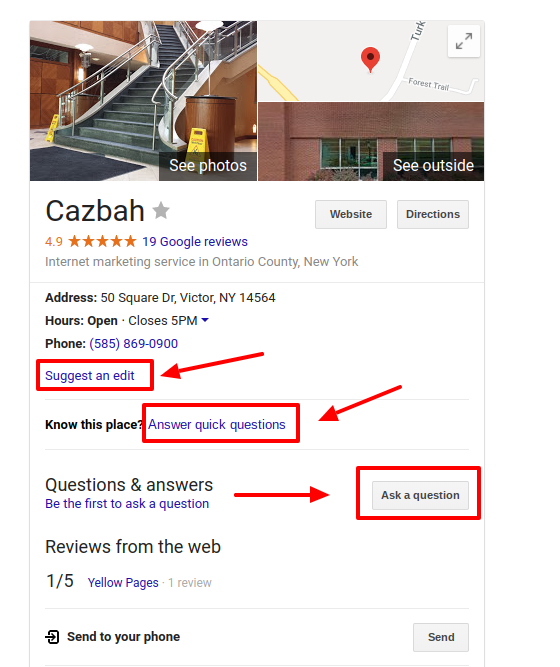 Do you know how your small business information appears in a local search result? Most of the new customers we get at Cazbah have no idea how they appear, or why it is even important. Local search optimization is one of the easiest ways to gain repeat customers for your small business because you can target your regional area. Many small businesses are so preoccupied with expanding their market beyond their local presence that they often overlook the potential gold mine they’re sitting on. Optimizing your business result for local searchers is easy and can gain you a better supply of steady customers. A solid local presence with search engines will drive more traffic to your website, your phone, and through your doors. It definitely pays to have a Google My Business page optimized and filled out. As a small business you’ll always be competing with direct competitors and big business to gain customers. Local search optimization let’s searchers know you exist! Think about it. 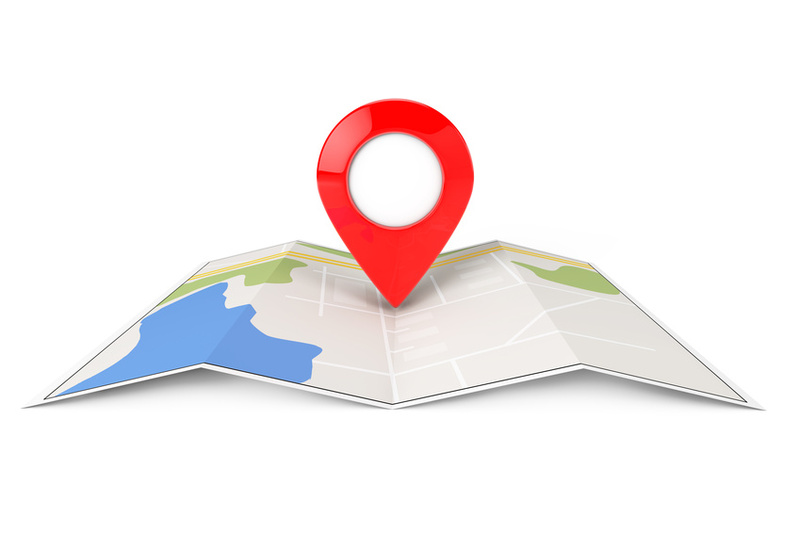 If a searcher is looking for a specific product or service, many times they’ll want to find a location near them. I can’t tell you how many times I search for “x,y,z product near me” on an almost daily basis. Once those first results come up, I won’t seek out any other stores. I want to find the best priced product where I am currently, so I’m not driving out of my way and wasting gas. Local search optimization is how you will connect with potential customers right in your area. A Google My Business page provides quick and easy access to all of a business’ contact information (phone number, address, hours, website link, customer reviews etc.) in a local search. It’s essential that all those information fields are filled out to give the searcher as much information as possible about your business and so Google will rank your result in the top 3-pack. Alright, if you’ve yet to set up a Google My Business page at this point, take this article and those stats as your rallying cry! Google makes it very simple to set it up and you can find the link here to create your Google My Business page. Google takes you through step by step as you enter your information as you build your business page. Once you create your page and verify it, that information will be indexed in Google Maps, Google Search, and various other Google local search operated indexes. NAP stands for Name, Address, and Phone. Search engines, as well as other online directories, all look for these three essential local search marketing fields when they index your business information in their results. This is the very basic information that all listings need to have. While your NAP info is a good starting place, you need to add further detailed information if you want to appear in results and gain more online and offline visitors. Any time you update any of this information, you need to make sure you go back and update it elsewhere too. If an online directory or search engine continues to use your old information, you’re potential customers won’t have a way to get in touch with you! Sometimes it’s not enough just to send a new address or phone number to a directory to be indexed. You need to make sure your previous and outdated information is deleted and no longer indexed. If you don’t, other directories and local listings will pick up both sets of information and confuse your customers who are looking for your small business. Just like every one of your webpages, your local search result needs to be optimized with specific keywords as well. As stated above, only the best optimized searches get ranked in the top positions, so it’s essential to choose keywords that help your business result stand out. For small businesses, it’s difficult to rank for generic keywords and often those simple keywords miss the point on what a searcher is trying to find. For your business page, you need to develop a local SEO strategy and target long tail keywords. Because you’re trying to rank in local search results, your target keyterms need to be geographically specific. 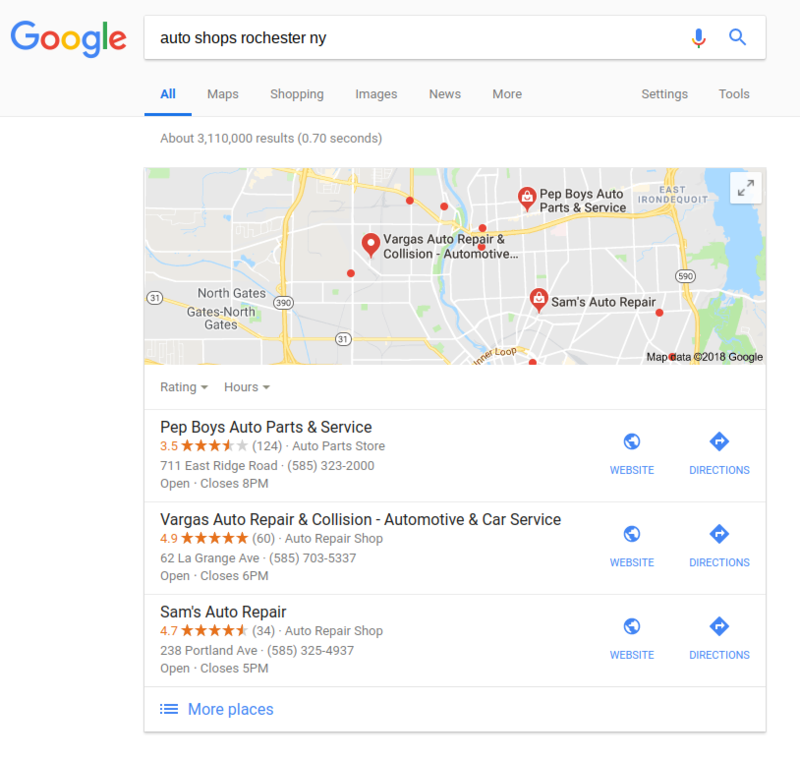 For example, instead of trying to rank for the keyterm “auto shop”, instead optimize for “Rochester auto shop “, “auto shops in Rochester”, or “auto shops near Park Ave, Roc”. The searcher is looking for a location near them, so they won’t be searching under “auto shop” anyway. That broad of a term could bring up results from all across the country! Target your local area and include your city or town’s name in your keyword to get the best local search results. Google, and other search engines, are always trying to personalize a searcher’s results to best fit their preferences. Search engines are smart enough to take into account the geographical location of a searcher’s smart phone, tablet, or laptop (whatever they’re using to perform a search) and bring up results nearest their location. Once you put in all the correct information onto your Google My Business page, you’re all done, right? WRONG! On your page, there’s this tiny edit option that anyone can use and change the information on your business page result. And, once someone else makes edits to your listings, you may not be notified, so you need to keep checking in on it to make sure the information you added stays there. As you can see in the above image, there are also places where searchers can answer questions about your business and there’s a Q&A section as well. Google allows these options to stay on your page to build a more robust result for your business listing. These features can definitely help your page result rank better, but in the case of a negative change from a competitor or customer, you need to be paying attention so you can fix it as soon as possible. 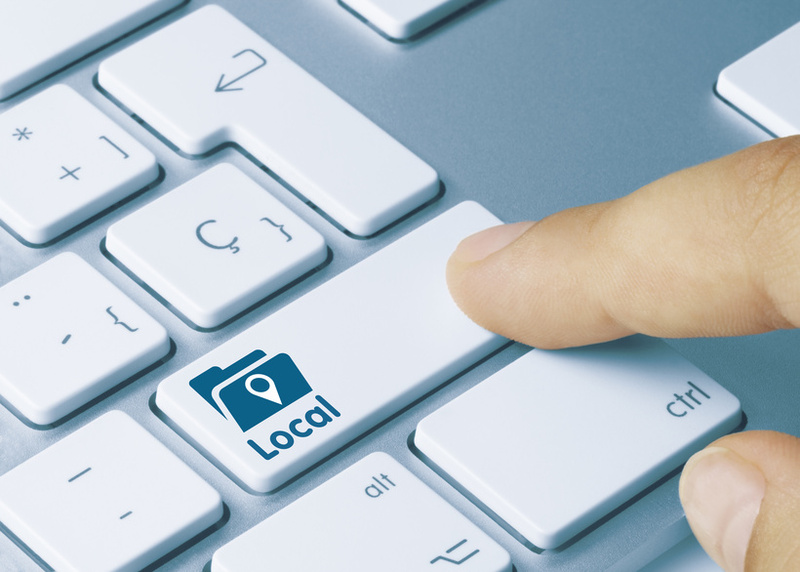 Local search optimization is important for small business success. It drives a lot of qualified leads to your website and through your business’s doors. If you ignore your local online presence, you risk confusing both prospects and customers, and will lose business. Creating and utilizing an optimized Google My Business page will give you a competitive edge in your local market and increase the brand awareness for your business in your community.